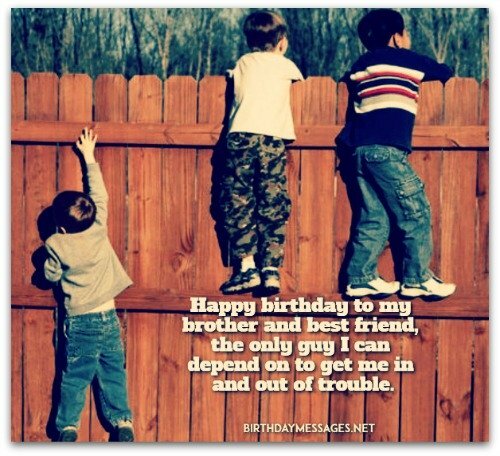 Brother birthday wishes, like brothers, can be awesome or lots of trouble. 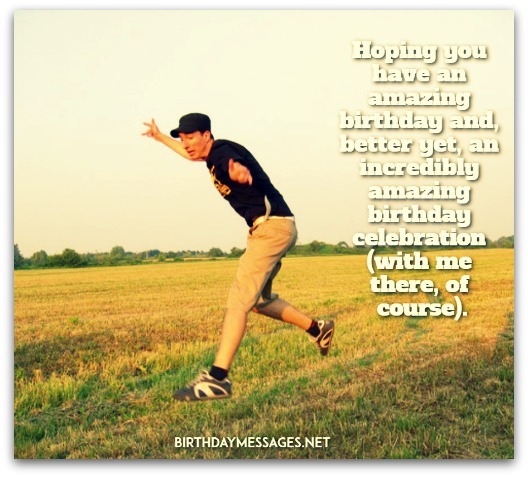 The birthday messages for brothers on this page are just awesome (even if your bro isn't). Below are brother birthday wishes that perfectly pay tribute to one of the best male friends you'll ever have. How do I know? Well, I have three brothers who are the best pals I'll ever have, my buddies for life. That's how. A blast from the past! 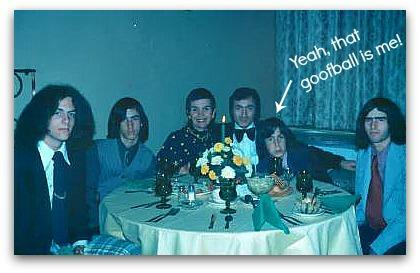 Your typical 1970s family. Great times with my Mom, Dad and brothers (the inspiration for the brother birthday wishes on this page). Happy birthday. Your positive outlook has always inspired me. Thank you for being the best role model in the world (and my world)! Your birthday has always been an incredibly special day for me. It's the day my brother and best friend came into my life. Hope all your BIG and small dreams come to life today. By showing me when to be gentle, kind, silly, honest and tough, you've taught me what it means to be a good person. I'm blessed to be related to you. Happy birthday, bro! Happy birthday to someone who has the privilege of always ending up in second place (after me, of course)! Just joking, bro. Sometimes, you come in third. Happy birthday to my brother and best friend, the only guy I can depend on to get me in and out of trouble. As you celebrate yet another birthday, don't forget that this is the time to remember! Happy birthday, bro! Happy birthday to the only brother in the universe who isn't a mean son of a (the other kind of witch)! A brother, despite the arguments and hassles you may have with him, is your buddy for life. Older brothers can be your best supporters, mentors and friends. Younger brothers, who can instantly become your proteges, will have your back for life. 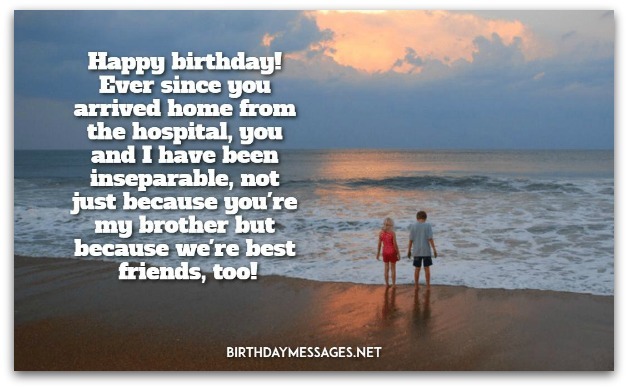 Brother birthday greetings should be special. That's because brothers are pretty special. I have three of them, all older. Things would be dramatically different and awfully empty if I didn't have my brothers in my life. They are my best friends. 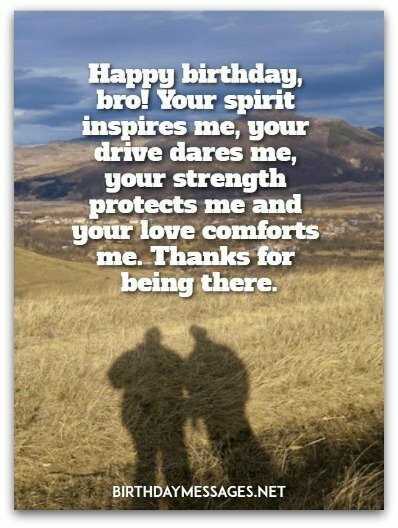 On his birthday, make your brother feel special with brother birthday wishes that express your love, support and respect for him. Despite what you may be told every day on TV or what you read on the Internet, brothers can be very in touch with their feelings and want more than a tie and generic "happy birthday." Picking any one of the inspirational brother birthday wishes below will do the trick. 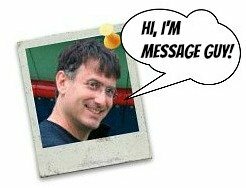 Funny messages are guaranteed hits, too, but make them slightly heartwarming. A sentimental birthday message for your brother would be the most appreciated. And the older your brother, the more sentimental you should be. Brothers, down deep, are suckers for mushy messages, just like the rest of the human race. I should know...I'm a brother, too. You're my favorite person after myself, my lover, my friends and my pet dog, but you're definitely my favorite brother. You've never deserted me. You're always there for me. Happy birthday, bro! Happy birthday! You’re more than my brother — you are also my BFF, someone I can depend on, someone who is always there for me. Thanks for supporting through thick and thin. We are brothers and best friends for life. Happy birthday, bro! Everything important that I've learned about life, I have learned from you (and your mistakes). Happy birthday, bro! Happy birthday to a wonderful guy, a guy who always has my back, a guy I can rely on, a guy who inspires me....My brother and best bud. 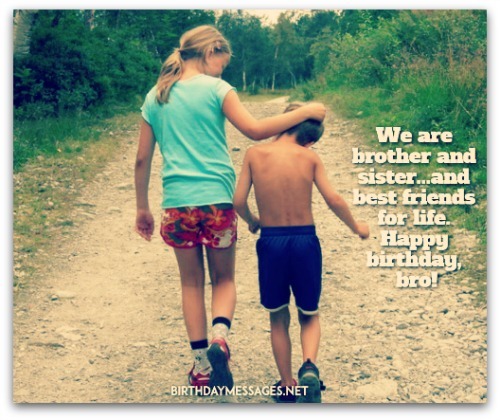 Share this birthday video with your brother! This will deeply touch your brother's heart! This special poem is for you. My brother I call home. Happy birthday, my dear brother. I love you. I'm glad you're in my life. Happy birthday to the world’s weirdest brother! I guess that's what makes you so interesting. Here’s to many more adventures in the future. I know we can choose our friends, not our family, but if we weren't brothers, I would choose you as my friend (BFF, in fact)! Happy birthday! I'm double lucky to have you as a brother and my very best friend! Happy birthday! I’ve always admired your beautiful, free spirit. May you soar to new heights today and all year-long. May your birthday be as wonderful as the day you were born, bro! Happy birthday, bro, from your partner in adventure! Stop counting the candles on your cake and start counting all the incredible memories we can make together today! Happy birthday! Happy birthday, bro! Your spirit inspires me, your drive dares me, your strength protects me and your love comforts me. Thanks for being there. Happy birthday! You're the best brother anybody could ask for. I'm glad I asked Mom and Dad for you. On your birthday, I thought you should know that I look up to you every day as the best brother anywhere. Happy birthday, bro! Thank you for being such a positive force in my life all these years! You’ve always known just the right thing to say to me when I'm down or up. Today, I just want to say I love you for it. Happy birthday. You always know how to cheer me up (especially after it was you who made me upset in the first place). Happy birthday. Need more tips before you pick brother birthday wishes? If your brother is the oldest child in the family, read this article. If he's the middle child, check out this article. If your bro is the youngest child, take a look at this article. Happy birthday to my favorite brother (for the moment). This is subject to change without notice. Just kidding! You're my favorite (person to tease). Happy birthday! There's no brother better than you. Of course, you're the only brother I've ever had, so I wouldn't know the difference. Actually, I know you’re the best. Happy birthday, bro! With this birthday, bro, you're beginning to look and act like Rod Stewart...the older version who looks an awful lot like Dad. Seriously, you look great. Happy birthday! Although I've never had your gift of the gab, I will do my best: I'm glad I have a brother like you — someone who I can honestly call one of my best friends. Happy birthday, dear brother! Hoping you have an amazing birthday and, better yet, an incredibly amazing birthday celebration (with me there, of course). You don’t have to tell me I'm your favorite sibling (that goes without saying). You're my favorite, too. Happy birthday. You’ve always had my back. I promise you I will always have your back, too. Happy birthday, bro. Happy birthday. I will always be there for you. You count on me, no matter what comes our way. My love for you is proportional to the number of cherished memories we've shared...and yet to share (we're talking in the trillions here). Happy birthday! Happy birthday! I never had a chance to choose you as my brother. If I had, I would have chosen you...a million times over. Happy birthday! I'm more than proud to call you brother. I'm blessed. Happy birthday to the least favorite kid in the family. Hey, don't look at me like that — there are only two of us, after all. My reason for picking the message on the birthday photo above as one of my favorite brother birthday wishes is personal, but I'll share it with you! This is one of my top picks because it touches upon what older brothers do best: protect you. They usually have your back, supporting you through thick and thin, just like my older bros. What a nice sentimental message to express to your brother. Every brother I know would appreciate this kind of recognition (and I have three of them). On your special day, forget about our differences. Forget about our fights. Just remember one thing: I love and respect you so much! Happy birthday, bro! Happy birthday to the world's best brother. No, happy birthday to the solar system's best brother. Actually, happy birthday to the universe's best brother. I'm so proud to call you my brother, especially when you're nice to me (which is all the time, of course). Happy birthday! 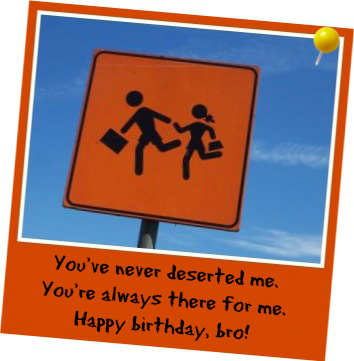 On your special day and every day, a brother like you deserves the best....a brother like me! Happy birthday, bro! Without you in my life, I wouldn't be afraid of the dark (from the show Dark Shadows), afraid of small spaces (like the dryer) or afraid of bugs (like spiders in my bed)! Thanks for the memories! Happy birthday! 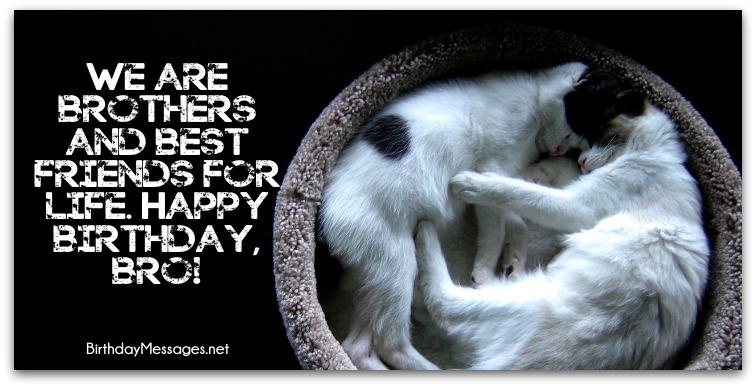 Hoping you spend your birthday doing your favorite things. The best for the best. That's you, bro! Happy birthday! Most people don't have the courage to say what they really think of you...to your face. I’m a blunt person, so I will tell you the truth. Here it is: You’re my hero. Happy birthday, bro! To me, bro, there’s nobody finer than you. You’re the best, as far as I'm concerned. If I wasn't Mom and Dad’s favorite, you would certainly be (for sure). Happy birthday! Happy birthday! Ever since you arrived home from the hospital, you and I have been inseparable, not just because you're my brother but because we're best friends, too! Happy birthday! Since you came into the family, we've developed a special bond with each other: it's called resentment bordering on revulsion. Just kidding. You're the best brother I know. What better moment than your birthday to declare just how special you are to me. Maybe next year. Happy birthday. As your younger sister, I feel it's my duty to tell you something very important on your birthday: I will always be younger than you! Happy birthday, old fart! Happy birthday. You're not only a great brother but also a great friend — two very good reasons why you should lend me money! Our childhood together was unforgettable. I'll never forget all the times you ate the last cookie, got me in trouble for something you did, farted directly on my face, gave me a wedgy...Those were great days, eh? Happy birthday. No matter where we are in the world, even if we're miles away from each other, we'll always we will always be closer than close in our hearts. Have an incredible birthday! Happy birthday! To my irreplaceable brother, I wish you a good life filled with good health, good vibes and good times! You're the most incredibly inspiring brother anybody could ever want. Thanks for having my back, especially in my darkest times. I love you. Happy birthday!